Learn about the different styles of designs for containers. 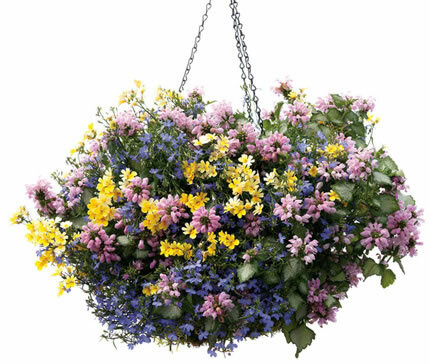 More than likely, every gardener, no matter how large or small the garden plants containers of some kind. For some people their entire garden is containers. 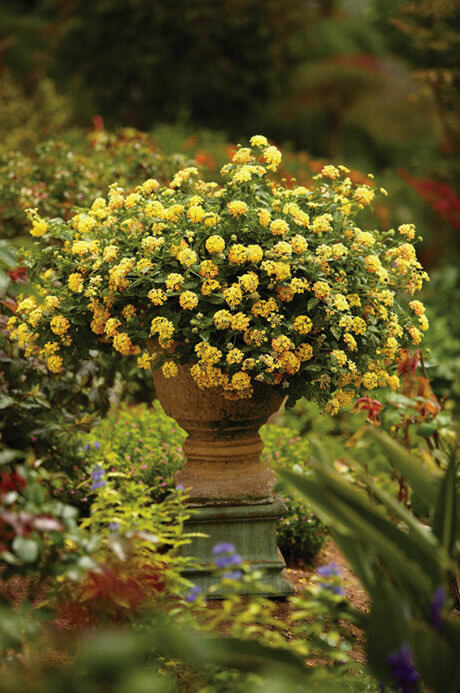 Proven Winners® is known for having great combination planter ideas and there are hundreds of container garden recipes available for browsing on our website. 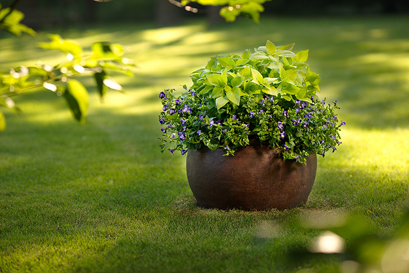 However, you may also want to design your own container gardens. This is one of a series of articles on designing container gardens. 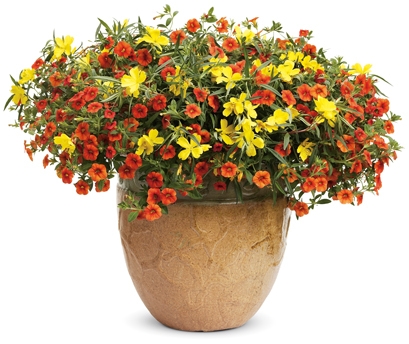 The first thing to consider when you start designing your container garden is color. 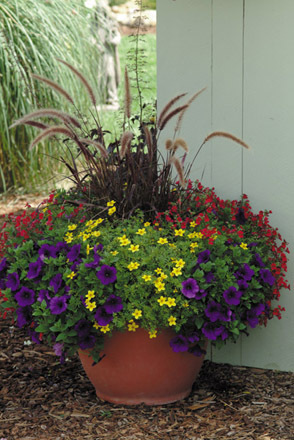 There are a number of different ways to combine colors in a combination planter. I will cover the main categories of color combination, in this article. The easiest container to design is the mono-crop or mono-culture container. 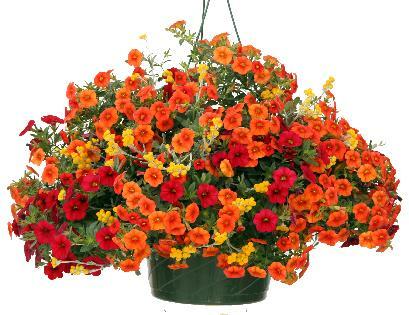 This is simply choosing a single variety for your container, although more than one plant may be used to fill the pot. It couldn't be simpler and it doesn't have to be boring. 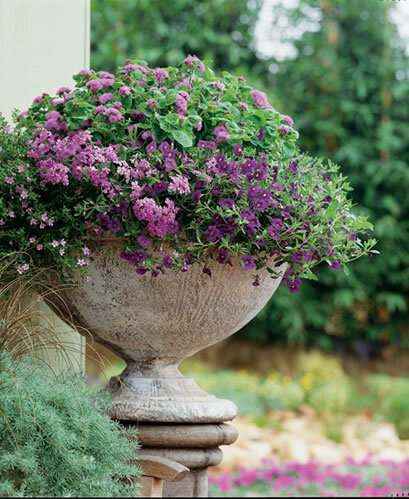 Mono-culture plantings are great for highlighting a great piece of pottery or creating a solid pop of color. When planning a mono-culture it is important to choose a plant that has staying power and will fill your container well. The pottry used adds another dimension to your design. 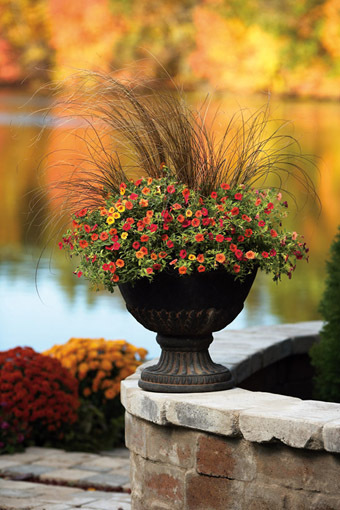 Any type of pot, from classic to colorful to a found object, can work with a mono-culture planting. To see more mono-crop recipes click here (they are mixed with mono-color designs). The next simplest design is the mono-color design. Mono-color or monochromatic designs use a range of shades of a single color - different shades of pink or purple, red or orange, yellow or blue. Mono-color combinations utilize at least two different shades of a color, but because you are using the same color you don't have to worry about the colors clashing. However, you still get some color variation. 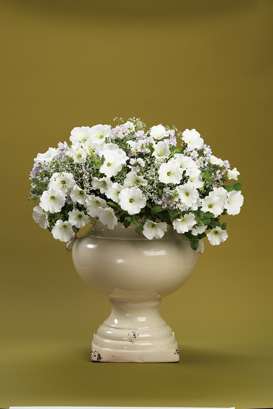 When putting together a mono-color design you want to choose a pot that is either a neutral color (white, terra cotta, black, silver, etc) or coordinates with your color scheme. To see more mono-color designs click here (they are mixed with mono-crop designs). The rest of the container designs are different ways of utilizing more than one color. 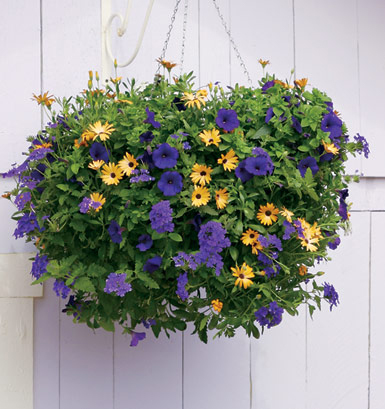 There are as many ways to combine color as there are gardeners putting together planters. If you are happy with the colors you've used, then other opinions don't really matter. However, there are some rules of thumb that can help you put together good color combinations. To really understand the use of color, a color wheel is helpful. This article on color in the landscape, illustrates the color wheel and showcases many of the concepts we will talk about, but applies the theory to landscapes. The first way of combining color is utilizing analogous colors. Analogous colors are next to each other on the color wheel and mix together easily. Some examples of analogous colors are yellow-orange, orange-red, yellow-orange-red, violet-red, blue-green, and blue-violet. Analogous colors can be bright or muted, but they lie next to each other on the color wheel. The color wheel used in the article on landscape color is very simple, but much more detailed versions exist. Thousands of colors exist and a more detailed color wheel can help you effectively use the many shades of color available. The photo on the left shows the analogous colors of blue and green. Below, the photo on the left is violet and red (lavender and pink). The middle photo shows red, orange, and yellow. The photo on the right shows yellow and orange. Now we are starting to get into the really fun stuff - complimentary colors. To design with complimentary colors, simply look at the color wheel and choose the colors that are opposite of each other. On our simple color wheel, complimentary colors are red and green, orange and blue, and yellow and violet. Complimentary colors create a ton of contrast and cause both colors to pop. Be sure to consider color intensity when using complimentary colors - you may not want to mix a soft orange with bright purple. Bright orange is better with bright purple. Don't forget that the pot and background around the pot can be a part of the color scheme, too. 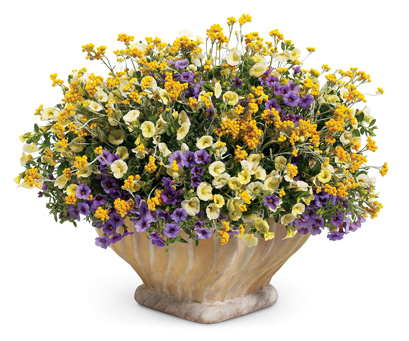 A cobalt blue pot with yellow flowers utilizes a complimentary color composition. The photo on the left, shows a red and green color scheme that incorporates not only flower and foliage color, but the container as well. 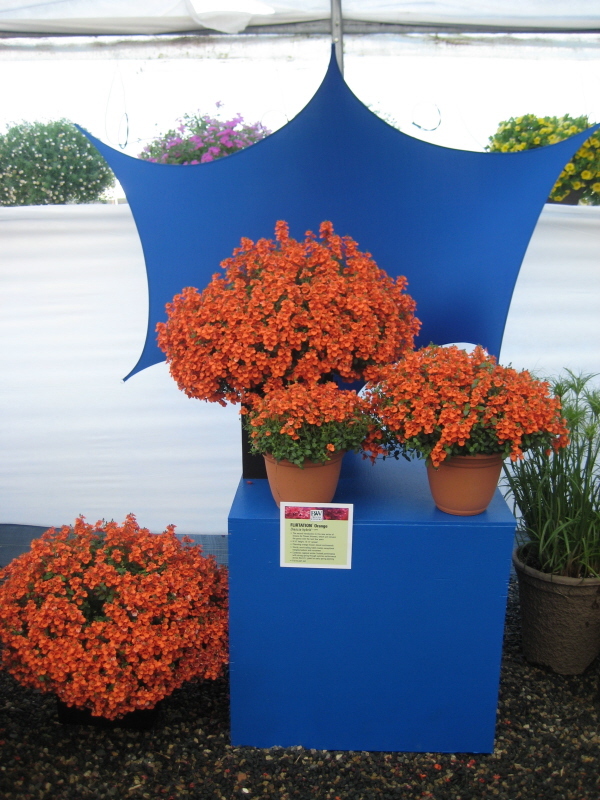 The photo in the center, demonstrates a blue-orange color scheme, utilizing Flirtation™ Orange Diascia against a bright blue background. The combination of these two colors makes each look better. The photo on the right, displays a violet and yellow color scheme. Using complimentary colors is more daring than the previous color schemes and can create more drama in the garden. The last color scheme is the triad. Triads use 3 colors that are spaced equidistant on the color wheel - the points of an equilateral triangle. Triads can be harder to pull off because you are utilizing several different colors. On the basic color wheel, we have been using there are two triads - red-yellow-blue and violet-orange-green. The photo on the left below shows a red-yellow-blue triad. The photo in the center shows a pink-yellow-blue triad. The photo on the right shows an orange-violet-green triad. In addition to the colors we've been talking about, there are a number of neutral colors including white, black, grey, silver and shades of brown. In addition to these neutrals, in the garden green also functions as a neutral. Neutral colors can be used with any color scheme to add dimension. Beyond just thinking about color scheme, colors tend to come in two different categories - hot colors and cool colors. Hot colors are red, orange and yellow. Cool colors are blue, pink and purple. Hot colors tend to draw attention. They are great to use in areas to which you want to draw attention. Place them by doors, walkways and in far corners of the garden to draw attention to spots that might otherwise be overlooked. They are great to use in spaces where people will gather. Cool colors tend to lend calm and tranquility. They are great to use in spaces where you want to relax. Consider matching your color scheme to the use you intend for each area of your garden or outdoor living space. I am always over or under watering. How do I get it just right? Tips please! Touch the soil. Judge if it is soggy, fairly damp, moist, less moist, dry. If too dry, the plant will wilt. Water plants when the soil is less moist, before wilt stage. Over water is watering too often when the soil is still fairly damp or moist. Have good drainage and do not not let roots set in water. For pots, water until it runs off through the drainage hole. 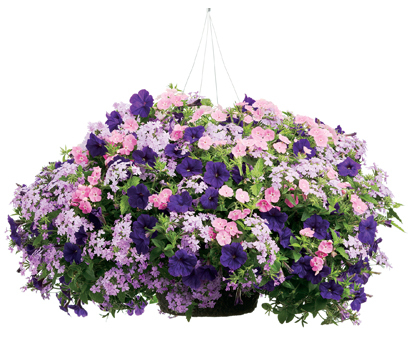 Optional to touching soil is lifting/tipping the pot to test the "water weight", such as in hanging baskets. If the plant is wilted, give it a little drink of water, not enough to run off, then wait several hours for the water to absorb into the soil and the plant, then another little drink of water. Another tip to help test soil moisture is to leave a wooden stick (bamboo chop stick or pencil) in the soil. Pull out the stick and see how wet is the end of the stick. 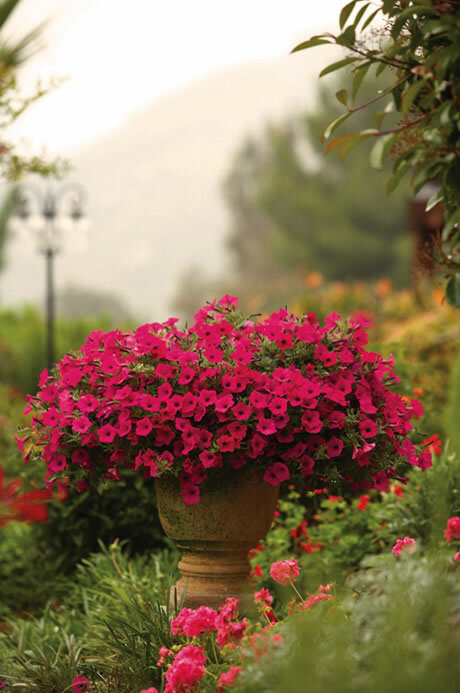 I’ve always received a booklet of container ideas and directions each spring. Do they send those anymore? How can I get one ? Teaching Container Gardening is a Joy with your Booklets!! I always give them the PW Web Site..Love it !! When are you coming to Florida? I don't currently have any plans to be in Florida. However, Dr. Rick Schoellhorn, who also works for Proven Winners speaks fairly often in the Gainesville area. Does anyone know where I can purchase the man's open mouth face planter!? I love a few unique things in my gardening and would love to find a supplier to purchase this from. Thank you in advance for any information or direction. It is not the same but similar in design. I do not think it is a planter but it looks like there is enough room on top to rig something up for a mossy type plant perhaps? Winners or TJ Maxx stores have some unique face and head planters. I have been gardening for over 50 years. At 6 yrs old I followed my dad around and "helped" him. I spend my winters planning & re planning what I will do in the Spring. My gardens tend to be in planters now as they are easier to tend to. Proven Winners are just what the name implies, "Proven Winners". I have people asking why my flowers look so great when theirs are struggling. I just say "Proven Winners". Thank You for the outstanding quality & Beautiful flowers! Thanks so much for taking the time to drop us a note. We work really hard to choose plants that have great summer performance and it is always great to hear that we are succeeding! Have a great week. This is so helpful. Thank you for including the photos! Your welcome, I enjoyed writing the whole series and it is always great to hear that someone has found the information helpful. Have a great week. Did you ever get a response to your question? I too live in Tucson and have a hard time getting things to grow and stay alive! Thank-you for the wonderful news letter. Living in Edmonton Alberta, in January is mostly a sea of white snow. The articles and pictures give me ideas for when the winter is finally over. Your winters are certainly tougher than ours down here, but the temp was -8 F when I got up this morning and 4 hours later it is -5. I do so enjoy the eye-candy photos when winter has us in her grip. I'm glad to hear you find them worth your time! Have a great week. Thank you so much for the wonderful Proven WInners Flower Show at MacKinace Island in Michigan last week. We stayed at the Grand Hotel, which was a treat. P. Allen Smith was GREAT! He was so nice and had such a great sense of humor. I even had my picture taken with him. Thank you Proven Winners for the Sensibly Pink Plant. I'm so excited about planting it and what a wonderful memory from this trip to the Island of MacKinanace. On our way down to the pier to get our Ferry to go back home, we shared a carriage with some people employed by Proven Winners. They were so nice. They asked us for suggestions for next year. The one we suggested was to have a carriage from the hotel down to the gardens and pool area to take us down and back up. It was very difficult for anyone with a broken ankle or an older person. This would help a great deal. Thanks for putting a package out so we could afford to come and stay at the Grand. Your seminars were very informative and we received a lot of good information about problems with different plants. Your people were more than nice and the question and answer period was very informative. Thanks so much. 4 very satisfied people that came from Connecticut to your flower show at MacKinace Island. The Munsons and 2 other friends that came with us. I love experimenting with PW plants, so many different sizes , shapes and colors ,with excellent quality. I mix perennials and annuals together to make gorgeous pots for my clients home. Their properties stand out from all others. 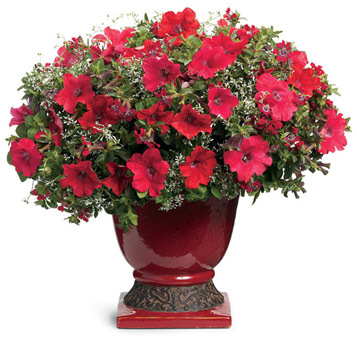 With Proven Winners plants it pretty easy and exciting to accomplish so many ideas with so much beauty. I always pick a nursery that sells PW plants. Excellent Quality.